The idea of fertility socks is not my own. I discovered the idea while hunting for a way to support fellow IFers who were undergoing fertility treatments. Being a knitter, I loved the idea that I could provide my friends with a personalized gift, while giving them both a way to remain warm while in the stirrups as well as a conversation piece. 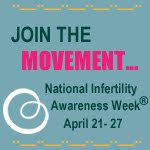 Over time, I've learned that support for infertility is not limited to those going through treatment. There were those at the beginning of the journey, those on a break, those who were adopting, those who were recovering from a loss/losses. And there were those who made it to the other side, but wanted a way to give back to those in the trenches. The idea was to have the socks be a way to support one another, no matter where one was at in this journey. A reminder for the recipient that they are not alone. In December, I wrote my first post about fertility socks, sharing with the world what I had created for three women with the hopes of starting a sock exchange for those undergoing treatment. The exchange was a success on a level I never expected; bringing women from different stages of this journey, as well as different backgrounds, together through a simple act of purchasing socks. For those who are interested in participating, please contact me or leave a comment below. My goal is to set another one of these up in the near future.